This is our review of IronSocket VPN based on real tests from China. 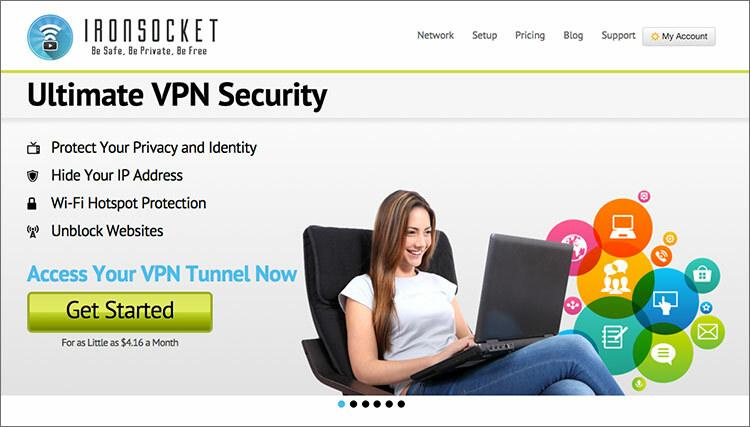 Besides our IronSocket review, we have also reviewed a number of other VPN services. If you are looking for a reliable VPN services to be used in China, Please also read our list of Best VPNs for China. Allows up to 3 simultaneous connections. IronSocket is a VPN providers based in Hong Kong. It started providing VPN service in 2005 as “HideMyNet.com” and then got rebranded as IronSocket in 2013. IronSocket offers severs in many different countries and supports all common VPN protocols. Many VPN providers’ main domains are blocked in China. However, Internet users in China can access IronSocket’s website without any problem. Based on our tests, we confirm that users can sign up for IronSocket’s services from China, and IronSocket’s VPN service can be used in China. IronSocket has over 50 servers in 36 nations, including USA, UK, Japan, Singapore, Hong Kong, Taiwan etc. It supports the following connection protocols: PPTP, L2TP and OpenVPN. IronSocket also supports HTTP Proxy, DNS Proxy (Smart DNS) and SOCKS5 Proxy. However, unlike most VPN providers we have reviewed, IronSocket does not provide their own software for using their VPN service. Instead, users need to install third-party VPN software such as OpenVPN Connect to use their service. Alternatively, users can follow instructions provided by IronSocket to set up VPN connections manually. This might be a weak point of IronSocket. In addition to VPN, IronSocket also provides HTTP Proxy, SOCKS5 Proxy and DNS Proxy (Smart DNS) services. IronSocket does offer detailed instruction on setting up VPN and proxy on many different platforms and devices, such as MacOX, Windows, game consoles and supported routers. For simultaneous connections, IronSocket allows users to connect to up to 3 devices at the same time. P2P/Torrents traffic is allowed on some of the server locations, such as Taiwan, Thailand, Indonesia and Russia etc. The rest of their servers (such as those in Japan, Hong Kong, US and UK) do not allow P2P. The price for IronSocket starts from $4.16/mo (if you pay annually). It offers a 7 day money-back guarantee for users to try out their service. As mentioned earlier, IronSocket doesn’t have their own VPN software or VPN App. Users can set up PPTP and L2TP manually on Windows or MacOS using the OS’s existing network options. For using IronSocket’s OpenVPN on desktop computers, users need to install third-party software such as OpenVPN Connect and Tunnelblick etc. We tried setting up IronSocket’s VPN on the OpenVPN Connect software on a Mac computer. The process involved going to IronSocket’s website to download OpenVPN config file for each server locations that you want to connect to, which was a little bit time-consuming. With many other VPN providers, you just install a software and all configuration will be set up automatically, and you can choose different sever locations faster and more easily. This is indeed a major disadvantage of using IronSocket. Then we used the OpenVPN Connect software to connect to IronSocket’s Japan server using the OpenVPN protocol. We got a download speed of 31Mb/s, which is a very fast speed. As you can see, the speed is slower than OpenVPN, but still quite good. However, we found it difficult to connect to some of IronSocket’s servers using some of the protocols, especially OpenVPN. When you download OpenVPN configuration files from IronSocket’s website, you have the option of choosing different encryption levels. We found even for the same server, sometimes one encryption level worked well while the with the others we couldn’t establish a connection. IronSocket does not provide any live chat option for customer support. Users need to fill out an online form to communicate with their support team. IronSocket is a VPN provider with servers from many countries and locations. The main advantage of IronSocket is their low price and the generous offer of 3 simultaneous connections. However, because IronSocket doesn’t provide their own software, users need to set up VPN manually or use third-party software. This might be a turnoff for some users who have no experiences doing so. Some of IronSocket’s VPN’s servers are not easy to get connected from China, But once connected, the VPN speed is quite good. This entry was posted in VPN Reviews and tagged ironsocket, review. Bookmark the permalink.